Pierate - Pie Reviews: Piefest UK celebrates a summer of pie fun! Piefest UK celebrates a summer of pie fun! This weekend (13th-14th August) marks the first ever "Piefest UK" celebration of pies in the one and only capital of pies - Melton Mowbray! From 10am to 4pm on Saturday and Sunday you can sample the many pie-lights of the UK pie scene all in one place - the Melton Mowbray Cattle Market (LE13 0HS)! We would have loved to have been there this weekend, having been invited along to do a talk on "How to rate a pie" - something we are of course the pie-fessionals at, having been on BBC One's hit show Rip Off Britain as pie experts, among other highlights. However "proper work" - as pie rating is sadly not yet a full time profession! - has got in the way this time, but we hope to be there next year! In the meantime, however, we very much hope people enjoy the first ever Piefest UK and look forward to hearing how it went! For more information on this first event, in the same town that hosts the annual British Pie Awards, check out their website! 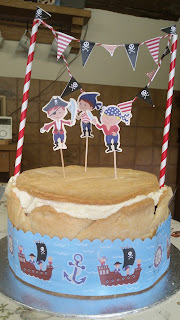 The Ship's Cook made this amazing Birthday Cake Pie! This official pie extravaganza follows hot on the heels of our very own Pierate Piefest 2016 just a few weeks ago, which was the first time in a long while we'd managed to get all the Pierateers under one roof. We sampled a range of lovely pies, including a crocodile and a game pie donated to us from Pierate Recommended Pie & Ale Manchester! They were both very nice and full of flavour, although split between 4 hungry Pierateers we will need to give them a proper review when we have a whole pie each during our next visit to the shop in Manchester! However the undeniable pie-light of our very own Pierate Piefest was the Birthday Cake Pie, made by the one and only Ship's Cook! 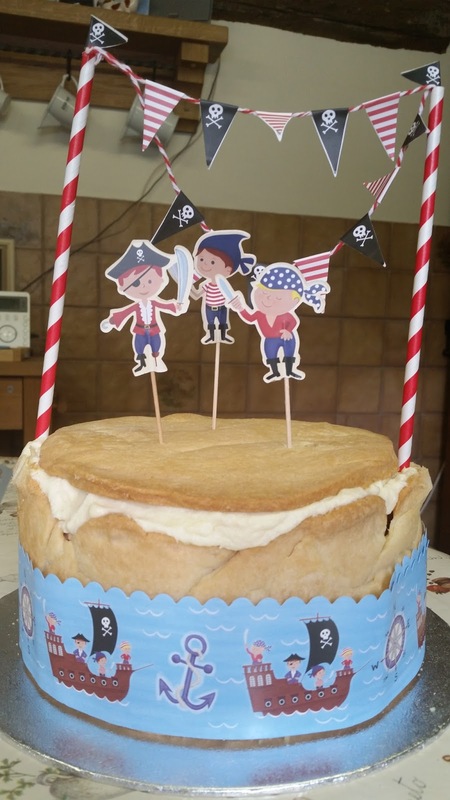 This amazing construction was a vanilla, strawberry and chocolate cake layered into and fully encased in sweet pastry - with a few pirate decorations just for good measure! And it tasted just as good as it looks! Amazing work! The only question we were left asking ourselves was why had we never had one of these before?!?! 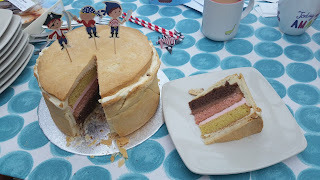 This Birthday Cake Pie (a cake in a pie) was followed the next day by Pierateer Rob going to an event hosted by Matt Williams of www.ratemysnack.co.uk - a food website that celebrates giant food and allows people to rate the snacks they see (and even submit photos of their own efforts!) Matt himself had decided to make a "pake" - which is pie in a cake. 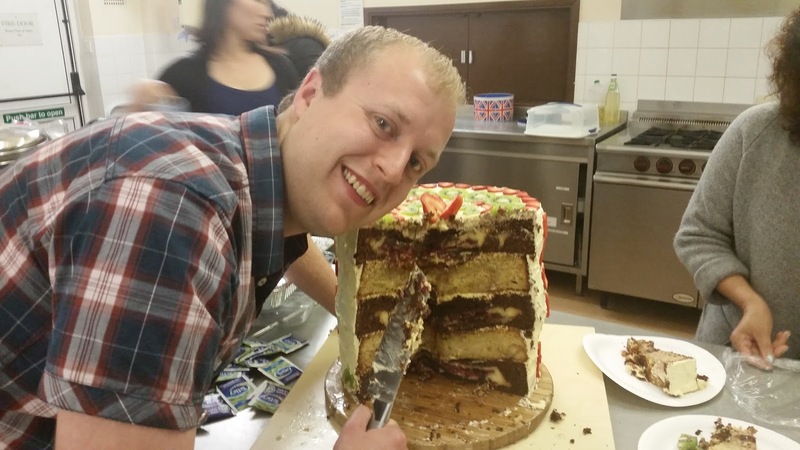 Although his colossal effort was actually loads of pies in loads of cake! Matt Williams and his "Pake"
Matt ended up using 10 fruit pies in five layers of cake/pie - with 3 layers of chocolate sponge with cherry pie inside and 2 layers of vanilla sponge with apple pie inside. I personally went for the vanilla cake/apple pie combo and it tasted very good! Great work Matt! The summer is always a bit of a quieter period for the Pierateers, this summer even more so. Work and life commitments come to the fore but don't worry - there are still some very exciting posts that will be hitting the world's number one pie blog soon! Firstly, if you've been following @pierateers recently you will know that Pierateer Sam has been checking out some pies Stateside! Yes, our Pierate Ship finally set sail to America, as Sam visited some pie shops in Chicago! However, like London buses, it won't be long until our second visit to America, as Pierateer Rob will be visiting New York in October! Look out for some awesome American pie reviews coming your way soon!!! And hot off the press is news that on 23rd October the Pierate Highly Recommended firm "Nice Pie" are hosting a Melton Mowbray Pie Eating Competition! We look forward to finding out more about that soon! As always, keep your pie suggestions coming in, enjoy some summer pies and we hope to review more pies soon!